Experience and personal attention are key considerations when hiring legal counsel. Our medium size but busy law firm provides one-to-one service by highly qualified lawyers who have achieved notable results and reputations in their respective practice areas. 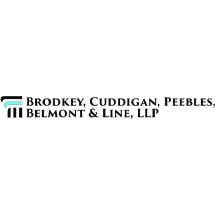 Brodkey, Cuddigan, Peebles, Belmont & Line, LLP, is a "one-stop shop" in the sense that our firm handles a wide range of legal issues. Unlike a solo practitioner who practices in many areas with expertise in none, our attorneys each have developed knowledge in niche areas of the law. This enables us to provide the best representation possible while maintaining the level of service for which we are known. At a big downtown law firm, you may meet with an attorney who specializes in a certain area of the law, only to be shuffled around to the new associate or paralegals. At Brodkey, Cuddigan, Peebles, Belmont & Line, LLP, many team members may contribute to your representation, but you will work with the same lawyer from start to finish. We serve individuals and small businesses in Omaha, Lincoln and surrounding counties, and practice in state and federal courts throughout Nebraska. Our practice includes business law, civil litigation, divorce and family law, real estate, Social Security disability SSI disability, estate planning and probate, commercial creditor representation, tax planning and IRS disputes.